Following the paleo diet and lifestyle is a time commitment for anyone, but when your life is already intensely busy, how do you fit it all in? This is a question I’ve gotten from podcast listeners, and in this episode, I invited three people in this exact situation to share their best tips. My guests are all mothers with autoimmune disease who also work outside the home. In spite of the multiple demands on their time, they have found ways to make a healing diet and lifestyle work. Let's learn from each other! They've created a paleo AIP version of a thin mint Girl Scout cookie! Chriss Scott-Polson is a community health worker, caring for the elderly and people with mental and physical disabilites in their homes. She has 3 children, ages 21, 14, and 11. She was diagnosed with celiac disease at age 4, had chronic pain throughout her childhood, was diagnosed with cancer in her late 20's, and developed psoriasis most recently. She hit rock bottom two years ago, where she felt like she could barely make it through the day. She was exhausted, depressed, experiencing chronic pain, frequent illness, and was often unable to work. 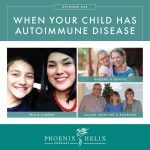 She was actually paleo at the time, and it wasn't until she switched to the paleo autoimmune protocol that she saw major improvement in her symptoms. Now, she has energy and vitality. She's able to work a demanding job 30 hours a week and still have energy for her family, too. Her pain has significantly reduced, her psoriasis has improved, she can exercise again, and she enjoys a social life as well. In addition to the dietary changes, she also realized she couldn't continue to care for everyone else and not care for herself. She began prioritizing relaxation, meditation, and yoga, and she also expanded her support network. Basically she learned to receive as well as give. Cristal Wilson is an early childhood educator specializing in working with young children with autism. She has a 20 year old son and a 12 year old daughter. She began having health issues at age 17 and has a confirmed autoimmune diagnosis of pernicious anemia, although several others have been suggested as well. At rock bottom, life became about survival. She had to take a medical leave from work. She needed help to get up in the morning. It was a very lonely time, because the people in her life didn't understand what she was going through. That was 6 years ago. Now, life may not be perfect, but she understands her body's needs so much better. She's learned how to say no and stop over-committing, so that she has the energy for the things that are most important. Now, she feels in control rather than being controlled by her illness. A nutrient-dense AIP diet combined with a positive mindset has been essential to this difference. Emma King has 2 jobs. One is vice president of event & learning strategy. The other is health coaching and blogging through the website Conscious Autoimmunity. She’s a single parent of a 9 year-old girl. And she has rheumatoid arthritis, hypothyroidism and chronic lyme disease. She shared her healing story on Episode 25, so definitely give that a listen. Emma: She was gluten-free before going paleo, but they had the convenience of eating in restaurants on busy nights. That disappeared when they went paleo, and the toughest transition was when she went full AIP. She actually hired a health coach to guide her through the process, because it was overwhelming. At first, she cooked all of their meals at home. Now, after successfully reintroducing some foods back into their diet, she has found a few safe restaurants she trusts and has that convenience again. But she still cooks 80% of their meals at home. As a single parent, finding a way to occasionally get a break from cooking is part of her self-care. Cristal: She was vegetarian before going paleo, and that was a tough change to make. But she has noticed that her body needs the nutrition that only meat provides. The other challenge was having to restock her kitchen with completely new ingredients. She did this in phases, using up the food they had in the house and then replacing it with AIP-friendly foods instead. Research was also a big part of her process. She needed to understand how and why the AIP could help her condition. The Paleo Approach is a great book for delving into the science behind the protocol. A Simple Guide to the Paleo Autoimmune Protocol is a great book to help you get started. Chriss: She went gluten, dairy and soy-free first, inspired by her son to help his ADHD. Next, she transitioned to paleo because she was still having symptoms even though her only diagnosis at that time was celiac disease. She did paleo successfully for several years but then developed psoriasis. That was the inspiration to transition to the AIP. All 3 guests didn't dive directly into the AIP, but took it in phases, which was easier for them in the context of a busy life and an easier adjustment for their families as well. For anyone who wants guidance through that process, there's an online class called SAD to AIP in SIX that helps people transition from a standard American diet to the paleo autoimmune protocol over the course of 6 weeks. Meal planning around the family's schedule. On busy nights, she puts a meal in the crockpot in the morning, so it's ready when they get home. She plans cooking for those nights when there's a little bit of free time. Batch cooking sessions with a friend. They help each other with the work, and it's fun friendship time simultaneously. Her children also join in sometimes. The end result is a stock of pre-cooked ingredients in the freezer for quick meals. She uses an AIP grocery list, to remember all the foods available to eat and make shopping easier. To keep herself from feeling limited on a restricted diet, she cooks with a wide variety of AIP-friendly herbs and spices. She also pays attention to the AIP foods her body craves, because it's usually a nutrient she needs. Recipe resources: The Great Paleo AIP Cookbook Roundup and The Weekly Paleo AIP Recipe Roundtables. Emergency Meals: She always tries to freeze a few extra portions from dinner, so they're available on very busy days. 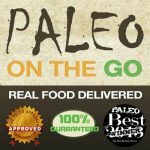 Another resource for emergency meals is Paleo on the Go. Evaluating what is and isn't working, and making changes where needed. This includes asking for help from her family, realizing she can't do it all by herself. It also means getting feedback from her family on the meals they do and don't like. This is especially true because she's the only one in her family who eats AIP, so she strives to find meat and veggie recipes everyone likes, and then her family can supplement their plates non-AIP ingredients. Taking time to replenish. This can be counterintuitive when you feel overwhelmed with multiple responsibilities and your family's needs. But when we don't do this, we become more and more depleted and everything becomes harder to accomplish. 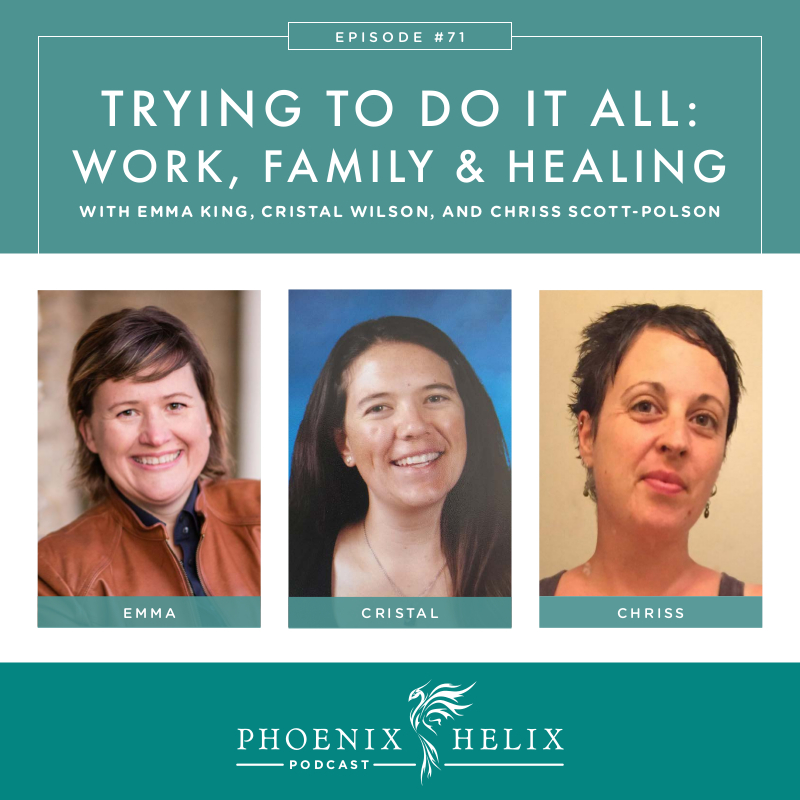 Taking time for herself allows Chriss to have the energy she needs to meet the responsibilities of her busy life. It doesn't have to be a big time investment. Small breaks can be powerful. Resource article: Ultradian Rhythms. The Instant Pot is 7 kitchen appliances in 1, but it's most famous for its pressure cooker function which cooks meals very quickly. Emma says this tool makes her feel like a hero, able to prepare home cooked meals even when she gets home late. 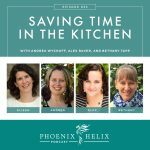 Resources: The Paleo AIP Instant Pot Cookbook, Podcast Episode 55: Saving Time in the Kitchen., and Emma's recipes on her blog Conscious Autoimmunity. Instead of batch cook sessions, Emma likes to just double or triple a recipe she's cooking like a mini batch cook, and then she freezes them in individual portions to grab as needed. Join a CSA (community supported agriculture). She gets a fruit and vegetable delivery to her house once a week, and they know her food restrictions and only send produce she can eat on her diet. This saves her valuable grocery shopping time. She also participates in a meat share, receiving a meat delivery once/month. Resource Directory: Local Harvest. If you don't have time to chop fresh vegetables, buy pre-chopped vegetables. Grocery stores have a wide selection of these now, from cubed butternut squash, to salads and slaws, to spiralized veggies. Frozen veggies are another great option to keep in the freezer. She and her daughter have daily check-ins where they talk about how they're feeling: if it's a good day or a tough day. On Emma's challenging days, priorities shift accordingly. If Emma doesn't take care of herself, she can't take care of her daughter, and there's no one else who can step in. So, self-care has to be a priority. Leave perfectionism behind. She has learned that her sleep is more important than a clean house. Cuddles count. Quality time with her daughter is a priority for them both, and that was a strong motivation for learning the time saving tips she shared above. Reach out to friends. Emma has learned to ask for help when she really needs it. If she has an autoimmune flare, her friends are more than happy to help with some of her responsibilities at home. She doesn't call them daily, but she is learning to call during times of crisis. She also does Morning Pages: a journal exercise where she puts all of her thoughts, worries and plans on paper, which helps her stay grounded and allows her to focus her day in a positive way. What do you let go when life gets crazy? Chriss: Keeping the house showroom ready. She also asks for help and has learned to delegate some responsibilities to others. Cristal: Outside commitments. She will renegotiate those when necessary, and she's learning to say no and conserve her energy for the things that matter most. A second strategy is to simplify the meals: she has some no-cook options available in her pantry for these times. Emma: She's built relationships with a couple of local restaurants, so on extremely busy days, they'll enjoy the convenience of eating out. This year, she merged her blog and health coaching practice with a partner. This was a big change that allows her more flexibility when other things take priority. Lastly, she's let go of trying to live up to the judgments of others. What's your hardline, where if you let this go, everything falls like dominos? Chriss: Self-care. If she lets that go, her health suffers and she's unable to do her job well or care for her family. Cristal: Her diet. The food she eats has a direct relationship on how she feels and what she can accomplish. Emma: Sleep is essential. If she starts skimping there, her health plummets. Emma is a health coach and blogger at Conscious Autoimmunity. Chriss and Cristal I met through my Facebook page where we have lots of conversations like this one, sharing advice and experience on a wide range of topics. Join us there! 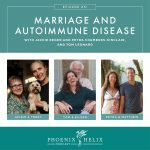 Eileen (your podcast host) has written 3 books: A Simple Guide to the Paleo Autoimmune Protocol (paperback and kindle versions), Reintroducing Foods on the AIP (PDF ebook), and 85 Amazing AIP Breakfasts (PDF ebook).